You may or may not know that we moved from Lititz to the Ephrata area this summer. We actually bought my parent's house, its the home that I moved into in the middle of my 4th grade year. That was a rough transition, moving in the middle of the school year to a new school, but I survived. Anyways, with the move we made this summer, came the desire to do some cosmetic updates, to make the home our own. We tackled three rooms, the bathroom, living room, and "master" bedroom. 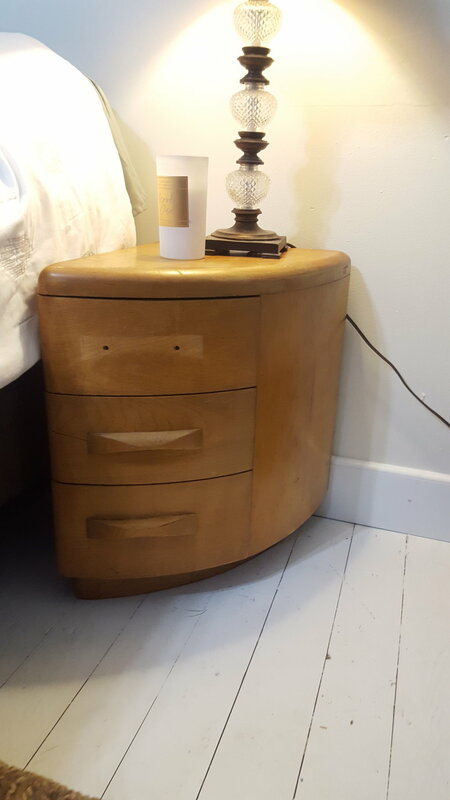 I think I 'll have to post some before and afters of those rooms later but with the master bedroom update came the idea that it was time to have matching bedside tables, something we've never had. I knew I wanted mid-century style. I searched and searched but never found what I was looking for in our allotted price range. 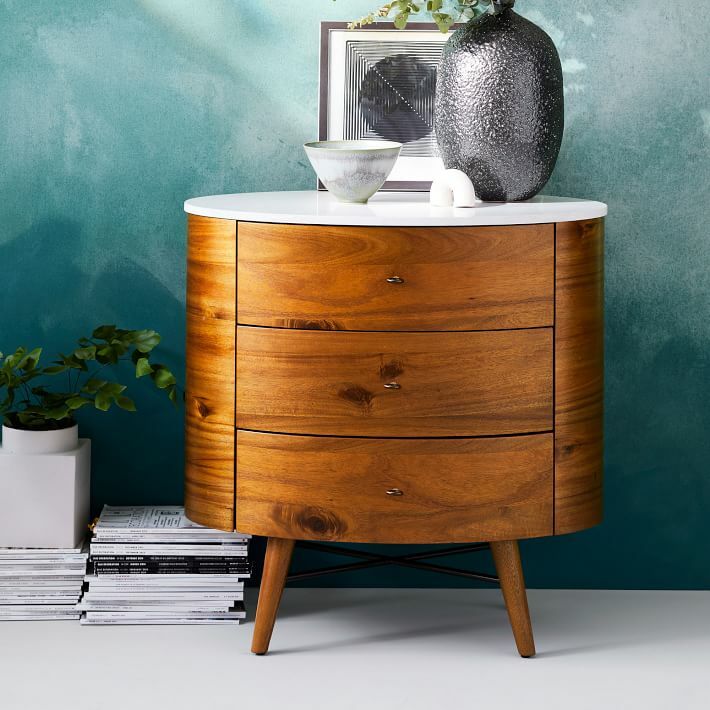 Love love love this beautiful bedside table from West Elm, but the price tag of $800 for just one, held me at bay. One day my mom and I were shopping and did a quick stop at a local used furniture store in our area, Garden Spot Furniture. I did a quick look and knew that they did NOT have what I wanted. Just as I was about to leave I saw another building that housed their "cash and carry" pieces. I thought, "why not?" I walked in and there they were! Two sad looking little tables, $25 for the pair. I was instantly in love. The shape alone stole my affections, not to mention the price. I wanted something unique, it wasn't until I saw these that I knew what it would be to make them "unique". The triangular shape is so fun and functional too. After purchasing the tables, I eventually made a visit to Home Depot. There I purchased the legs & drawer pulls. There was some trial and error here. I wanted bar style pull handles but the drawer is curved so I went with these very simple sleek arch pull. I originally only bought 3 legs per table, but as soon as I opened a drawer the whole thing tipped over! Oops. So I had to go back to the store to buy the extra legs, which severely delayed the completion of this project because finding time to go shopping is not as easy as it use to be before kids. I then started the process of sanding and staining, drying, sanding, clear coating, drying, sanding, clear coating, and drying. DIY projects take so much patience when you have to allow HOURS for things to dry in between steps. I own a palm sander which makes the job go much quicker. After the sanding, staining, and clear coats were dried, it was time to add the legs. I love mid-century furniture because having space between the furniture and the floor gives the illusion of more room. Plus the legs gave the tables a little more height. I was very proud of myself that I remembered to buy the hardware that you need to attach the legs to the table. I got these legs at Home Depot as well. It was fairly easy to screw the plates into the bottom of the dressers and then attach the legs. I was stumped when it came time to put the pull handles on. The curve of the drawer meant I had to put the screws in at an angle. Thankfully my husband came to the rescue and in a matter of minutes had all the handles in place. I absolutely loved how these little bedside tables turned out. The warm wood looks great in our “white on white” room. But now I'm feeling the itch to replace our lamps. That is the problem with updating things, it spreads from one thing to the next! Total approx cost: $40 a piece or $80 for the pair. So, it's NOT West Elm but it more then meets our needs functionally and I love the mid-century look that it adds to our bedroom. These DIY projects take time, and sometimes they fail. But then there are times that at the end of the day you absolutely love what you have created. This project, its one of those times. I am a lifestyle photographer based in Lancaster Pa. I specialize in baby photos but I do take senior pictures as well as family photos. Interested in learning more about a lifestyle session? click here. Or for a client guide with my prices click here.